IT’S OFFICIAL: Jack and Eugenie. 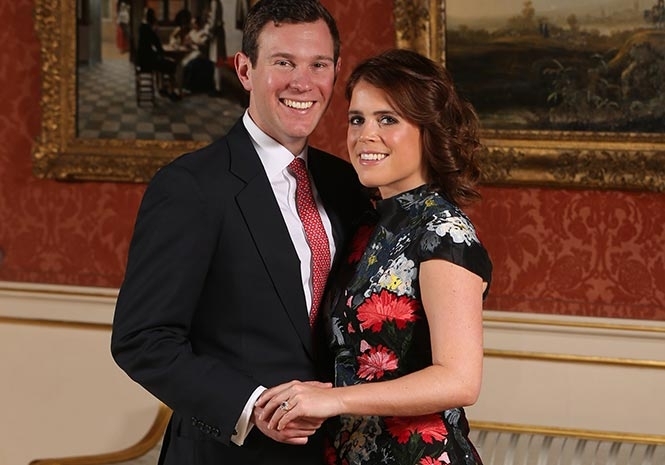 PRINCESS EUGENIE is to marry long-term boyfriend Jack Brooksbank. The 27-year-old daughter of Prince Andrew and Sarah Ferguson will tie the knot with the nightclub manager, 29, at St. George’s Chapel, Windsor, on an as-yet unconfirmed autumn date. It will be the second royal wedding at the venue this year, with Prince Harry and Meghan Markle set to exchange their vows in May. The pair met around seven years ago while skiing at the Verbier resort in Switzerland and have been together ever since. Mr Brooksbank is manager of glitzy Mayfair club Mahiki, renowned for its celebrity clientele including Princes William and Harry and Eugenie’s sister Beatrice. Official engagement pictures from Buckingham Palace have already been released, and show Eugenie wearing a ring featuring a padparadscha sapphire – a rare jewel from Sri Lanka – surrounded by diamonds. She is the second daughter of the Duke and Duchess of York and is eighth in line to the throne, although she does not currently undertake and royal engagements. Sarah Ferguson tweeted her “total joy” in the wake of the announcement.